Almond flour (or ground almond) has become very popular recently. Its gluten free and low in carbohydrates so many dieters experiment using this ingredient. 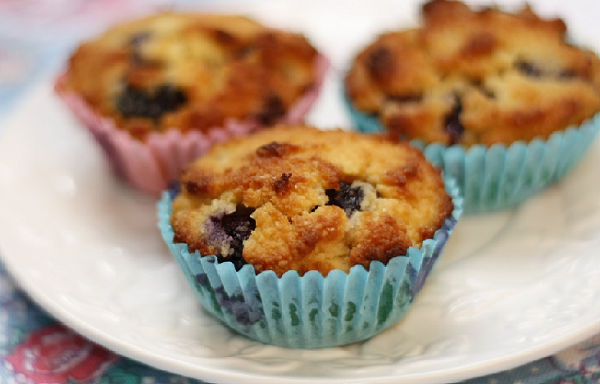 I wanted to try it out and because I’ve always loved blueberry muffins I decided to go for this recipe. The result is very nice. I wouldn’t say these muffins are similar to traditional ones made with flour but they are very tasty. Almond flour is quite filling and heavy so the good news is that you will probably stop on one or maximum two muffins with your tea or for a quick breakfast. 2. Mix dry ingredients (almond flour, lemon zest, sea salt, baking powder and fructose) together. 3. Add wet ingredients (eggs, milk, vanilla extract, butter) and mix well together. 4. Add blueberries and fold in gently. 5. Divide the batter into muffin cups. The batter is quite firm so you will need to use a little spoon to level the batter nicely. The muffin cups should be filled to the top as the batter doesn’t rise much. 6. Bake about 20-25 minutes until lightly browned on the top. Just wanted to let you know they freeze really well Ewelina:))) I made some teeny ones, with the petit four cake cases, and as I dont have a big sweet tooth are perfect for a two bite shot of sweetness. I put them in my lunchbox at breakfast and they are defrosted by lunchtime. thanks for your blog.